It was a long wait for the Miles Davis reissues by historic audiophile label Mobile Fidelity Sound Lab (MoFi) but the day has finally come and some of them are already out, recently MoFi remastered and reissued several Miles Davis albums such as Round About Midnight, Milestones, Four & More and In a Silent Way, and by now all Jazz and Music lovers in the world patiently await the arrival of MoFi's Kind Of Blue reissue on double vinyl LP cut at 45rpm, but until that one is released I was able to get my hands and ears on Miles Davis Round About Midnight which is one of my all time favorite LP's and here I am to share my findings with you about the work MoFi did on this one. Until now, there was only one audiophile mastering attempt from Speakers Corner that was released in 2008 on 180gr vinyl pressed at the famous Pallas Germany production plant, and that was the only valid option along with the original USA vinyl releases to hear this magnificent LP that had been mostly ignored by audiophile labels in the last few years and only now a reputed audiophile house with strong credits such as Mobile Fidelity Sound Lab decided to give this masterpiece the special treatment it deserves using the Original Analog Master Tape and mastering it 100% analog on a reference cutting system. 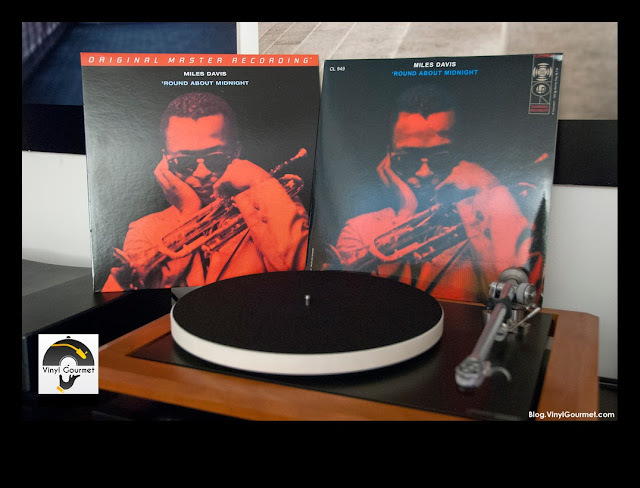 For this reason, and because many readers have asked me to provide my view about this matter, it makes perfect sense to do a comparison review between the two versions and find how different the Speakers Corner LP and MoFi LP sound and which is the best buying option. First impression is the quality of the MoFi packaging, looks much better than the Speakers Corner (SC) packaging and feels more solid. The SC is no cheap jacket, but compared directly to the MFSL it does feel a little wobbly and the cover looks less detailed... But now let's talk about the sound! After giving both LP's a very nice cleaning on my Record Cleaning Machine (I do this for every record even new ones to remove any debris or release compound left over from the production line), I played both LP's on my system. After listening to both LP's a few times focused mainly on just the first two tracks of side A to keep it simple, more objective, and allow me to catch every little difference and nuance, I then took some time listening to each full album straight without interruption to get a better general feeling for each version mastering approach and during this phase I took some notes about how they compare. - Overall dryer and sweeter sound, everything sounds natural and effortless. It feels great to listen to this LP, makes the listener feel good. This is clearly a reference record allowing the listener to enjoy the full scope of this recording and brilliant performance. From the first touch of the needle in the groove this LP guarantees huge levels of audiophile and emotional pleasure. - The overall volume level is much lower on the MoFi release and usually this is a good sign regarding sound quality in these days of "loudness wars", you really need to crank the volume a lot to take full advantage of the great dynamic range and resolution. - There is better tonality and more focus to the sound of the bass. - Sound stage imaging is better defined, the sense of depth from this mono recording is amazing on this new MoFi mastering! 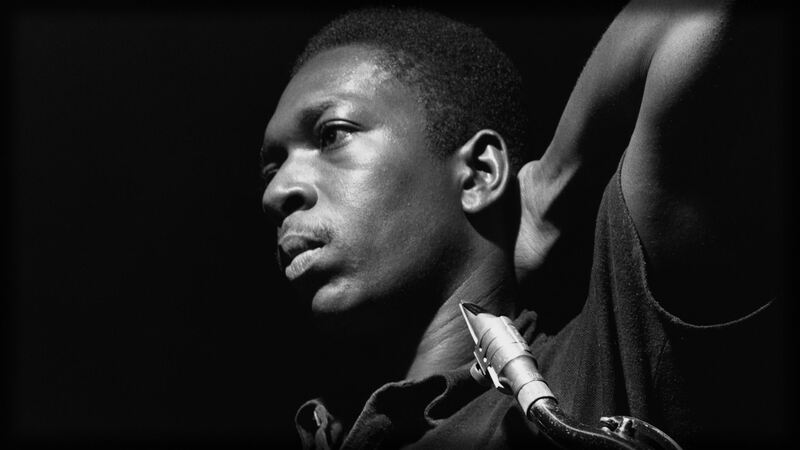 - Coltrane's tenor saxophone has more body and better more realistic tonality, its presence in the mix results better on this LP. - Cymbals are better placed in the mix sounding sweeter and more extended without any obvious frequency roll-off, you could listen to them all night and just smile without any listening fatigue. - Overall tonality is less natural, sounds over produced, it feels more like the mastering work was heavy-handed. - There is what I like to call as detail overload presented in somewhat artificial fashion, every little detail, every little tiny bit of spit and ambiance cues just jump out of the speakers as if the music was secondary content of the recording. You can get all that detail from the MFSL (if you play it at the same higher volume level) but those details are never more than details, as it should be to keep the realistic sound presentation of the recording. - There is exaggerated edginess to trumpet and cymbals sound. Not only this made them sound more artificial but it also becomes tiring to the ears making it much more difficult for the listener to become involved with the music. - Seems like some compression and/or limiting of the dynamic range was applied, that explains the higher volume output (despite the larger dead-wax area on both sides) and the lesser spacial quality of this version. Dynamics are much more flat, and even if this effect can make everything sound louder with apparently more thump and energy, it does so at cost of a natural realistic sound presentation. - Spatial cues from the mono mix (and now I know it can sound much better after listening to the MoFi) are all but eliminated... depth is severely reduced, now there seems to be a wall from where all sounds emerge and compete for the sound stage. After listening to track 1, all these differences were there but the Speakers Corner LP was holding its ground, while sounding much different I could understand how that type of sound might appeal to some people, with all the detail jumping at your face, all that energy and sound projection jumping out of the speakers... in fact that is the result of some added compression applied during the mastering session or already present in the mix tape used to master the Speakers Corner LP. I prefer the more focused and natural sound of the MoFi but on this track there are some merits to the SC that I can understand if you like that type of sound or if your ears are used to those levels of compression and limiting... however, as track 2 starts, it's immediately clear that such technical approach would not work for the entire album in such an acceptable manner, it becomes obvious how those "artifacts" turn out to be a big problem to the Speakers Corner LP, with the higher paced rhythm of this track everything sounds more confused and the MFSL really shines making sense of all the instruments and keeping the swing right where it should be, at your feet! The Speakers Corner version is not really bad, far from it, but direct comparisons can do this to you, it can be very revealing and put some things out in the open that were previously just invisible to the listener when playing just one of these records separately. You can live with a certain edition for years perfectly happy until a new mastering comes along and shakes your sound tree showing you just what you've been missing all that time... it's true, this happens, we Humans are not perfect and sometimes we need to have information placed right in front of our noses before we can actually see what has always been there. This doesn't mean that the Speakers Corner LP is bad (that would be quite unfair), what it does mean is that the new MoFi version is really exceptionally good. This is obviously the result of a very careful production effort, extremely tasteful work and an increased perfect sense of aesthetics, and most of all the ability to know the profound difference between superficial audiophile work that aims at making a sound demonstration and the real audiophile work that aims at making a decisive contribution to shorten the path between listener and musical performance in an effort to increase the emotional bond between them. Speakers Corner is a very well known label that has been regularly producing good records and sometimes releasing some very fine sounding LP records over the last years, some of the titles in their catalog are reference quality records for their respective albums (mostly rock/pop), but I wouldn't consider them to be at the top of the Audiophile LP's game. On the other hand, Mobile Fidelity Sound Lab is one of the best known and respected Audiophile Labels with a long history and impressive reputation for many years now as they've been providing music lovers worldwide with many of the best music and reference LP's ever made, but they are not 100% perfect and there are some MoFi releases that failed to surpass the original LP sound quality or some releases of the competitor companies in this business. 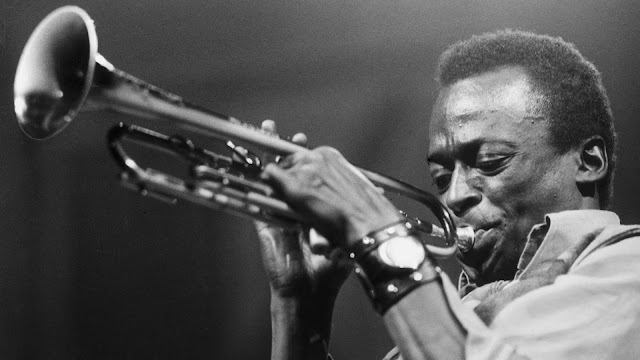 I guess nothing is perfect and there are always exceptions to every rule, but in this case there is no doubt in my mind, the natural order of things has been kept and MoFi gave us the best reissue ever made of Miles Davis masterpiece, Round About Midnight! I couldn't imagine it sounding any better than this, thank you MoFi! 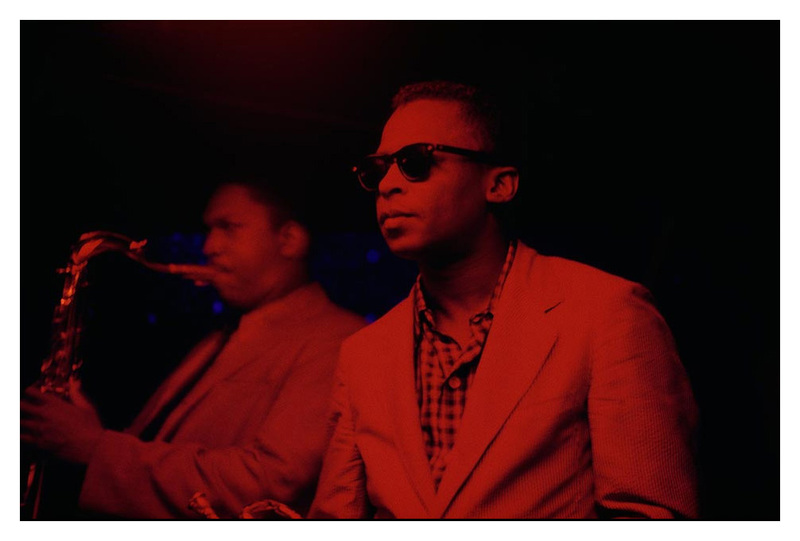 I can't wait to hear what they're doing with the Miles Davis Kind Of Blue reissue on 45rpm double LP that is expected to be released sometime by the end of 2013. I do have the Classic Records 33rpm 200gr Quiex vinyl LP and the 50th Anniversary BOX with blue vinyl LP (both 100% analog productions) and they sound great in different ways, I hope to be able to compare them to the future release by Mobile Fidelity Sound Lab and post it here in the Vinyl Gourmet Blog. It was this record released in 1964 that immortalized famous tunes like "The Girl From Ipanema", or "Desafinado" and "Corcovado", marking the definitive invasion of the Jazz World by the Bossa Nova wave by then also wide spread to the POP music world and the general public. Recorded in 1963 at A&R Recording Studios in New York and released by Verve Records the next year, it was one of the best selling Jazz LP's of all time winning several awards including the prestigious Grammy Award for Best Album Of The Year in 1965, the very first time for a jazz record and something that would take another 43 years to be repeated by Herbie Hancock and his album "River". Also worthy of note it was awarded the Grammy for Best Engineered Album (Non Classical) which is telling of the care taken during the recording and production of this LP, despite the unusual twist of events that occurred during the original mastering session that resulted in the perpetuation of a technical mistake that I'll describe later in this article. The music needs little or no introduction, these tunes and melodies have been part of our collective imaginary for decades now, it's a true classic album filled with huge names from Jazz and from the Bossa Nova movement in Brazil featuring Stan "The Sound" Getz on tenor saxophone, João Gilberto on voice and guitar (one of the founders and best known voices of Bossa Nova) and António Carlos Jobim on piano (composer of most tracks in the album and also a major founder of Bossa Nova). 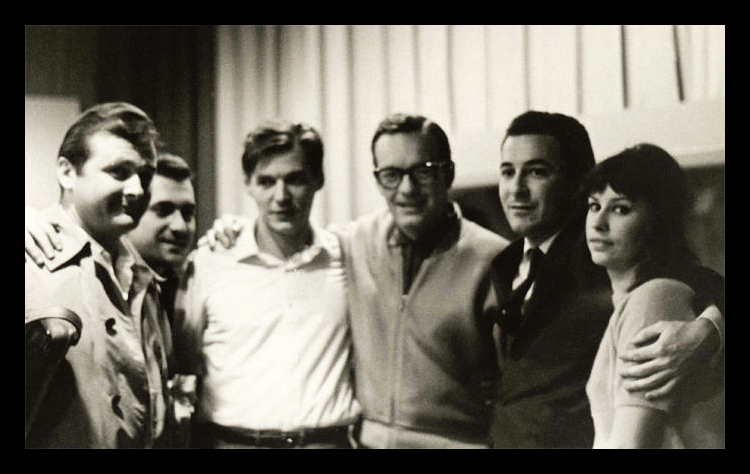 Along with these big names the album also features Milton Banana on drums (his role in Bossa Nova and his contribution to this album are very important), Sebastião Neto on bass and somewhat unexpectedly the voice of Astrud Gilberto who just happened to be in the studio with her husband João Gilberto who suggested to the production team, out of the blue, that she should sing on some of the best songs thus forever making Astrud's sweet voice known to the world which resulted in the start of her own international career. Speaking of Astrud Gilberto, the beautiful wife of João Gilberto, there are some interesting stories and rumors about her participation in the recording sessions where she became involved with Stan Getz, a fact that was made public only one year later and that might help us understand the tense atmosphere in the studio in spite of the cool and relaxed mood of the music. Throughout the years details have surfaced about the difficult relationship between João and Stan and their harsh coexistence in the studio around that time. Rumors have it that João Gilberto, not very good at English by then, would refer to Stan Getz as "gringo" (or worse) as he sent irritating messages forcing Jobim to do translation work between them. 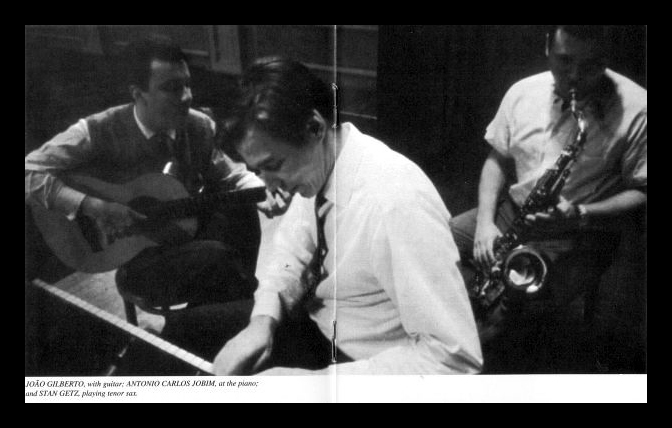 Jobim, always a gentleman, tried to keep them calm by making the communication seem less aggressive and more elegant than what it really was meant to be... but without much success. 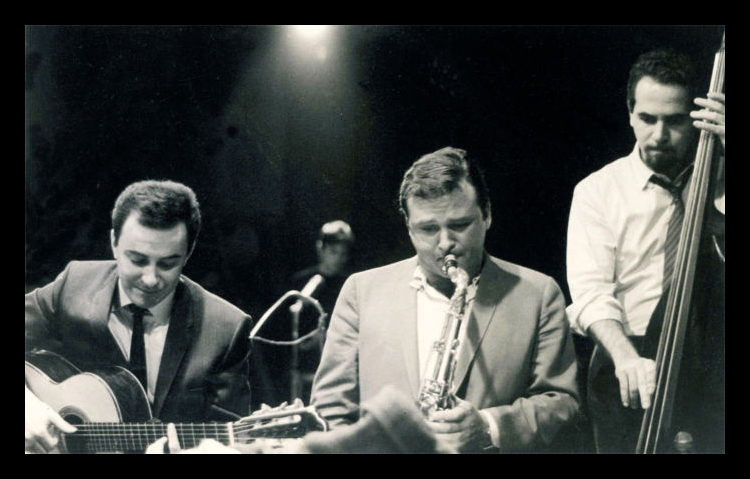 João Gilberto would later accuse Stan Getz of purposely playing the saxophone too loud and even asking the engineers to make it stand out more during the mixing of the album only as a way to self-promote and reduce João Gilberto's relevance which could have impacted the overall balance of the album that was meant to sound less intrusive and more relaxed. 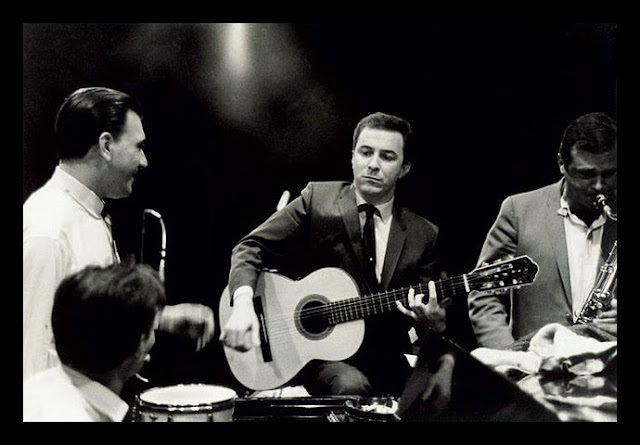 This problematic relationship can be seen in some of the photos of the recording sessions where Stan Getz often appeared smiling but João Gilberto sometimes appears to be bored and disturbed... maybe justifiably so. We are quite fortunate because this animosity didn't throw off the session and it doesn't seem to have affected the music at all, or maybe it even helped to give it a little edge. The Master Tape (stereo mix-down) is then copied to a Safety Tape (as a precaution) and used in the very first mastering session to cut the vinyl record, it is believed that this first mastering was made by Ami Hadani but I was not able to confirm this. In this critical moment, and for reasons that are completely unknown, there was a channel inversion that switched the position of the instruments/voice of the left side channel with the instruments of the right side channel effectively inverting the stereo sound field which resulted in changing Astrud's beautiful voice to the right side of the sound field and that is the way most people have experienced this album, but in fact that's not the way it was recorded in the studio or how it was originally mixed to the Master Tape. So how and why was this channel inversion replicated for so long? Another set of tapes called EQ Cutting Masters were copied from this first mastering session forever preserving the channel switch as well as all the other usual mastering moves and technical options carried out during the session so that these same exact mastering steps can be repeated on later reissues or to release the album around the world without significant changes to the sound signature of the album. These EQ Cutting Master tapes are the ones that were commonly used and distributed for mastering subsequent LP (and CD) releases of Getz/Gilberto at least until 1997 when this album was reissued and remixed from the 3-track tape, probably because they couldn't find the original Master Tape and the only option was to remix... It's not absolutely clear if this technical issue was intended or if it was indeed a mistake, but it is mostly consensual by now that it was in fact a mistake that resulted in the unexpected channel inversion because there is no mention at all about such a radical mastering option in the original mastering notes where all these details were registered. So this is how the switched channel orientation was replicated for decades to become a huge commercial success based on this technical mistake that was most likely caused by some inverted cable set on the mastering console of the original mastering session of Getz/Gilberto. What we do know is that this tape had not been used for mastering of any release since 1980 up until now, in this 31 years time lapse all other reissues on LP, CD, SACD, DVD-A or sound file, were sourced from a safety copy, or EQ Cutting Master, or remixed from the 3-Track tape. After a long research to locate and identify the true original Master Tape (Phil Ramone's 1963 stereo mix-down) and going through several catalog storage facilities with difficult or plain wrong labeling of A-File/B-File material (as can be read on the tape box cover) or other typical archival mistakes, it was necessary to evaluate the condition of the Master Tape and its viability for use after more than 50 years in storage and likely mishandling damage. As it is to be expected after all those years of storage manipulation and possibly not being treated as a true Master Tape by many, some loss of information may occur as the tape deteriorates. After careful inspection, George Marino and his team considered it was possible to use the Master Tape to take advantage of the sonic benefits of a first generation tape and keeping the noise and distortion levels to a minimum at least as low as any other release of this album that used a second generation tape as source for mastering and that was not drenched in damaging noise reduction filters. 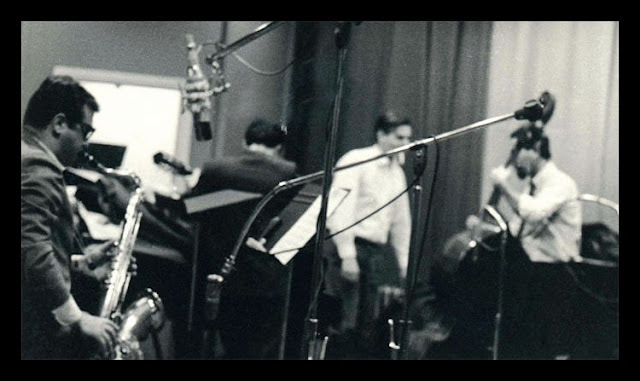 And they were right, even though some age related sound artifacts can be heard in places they are in no way intrusive and the overall transparency of the tape to lacquer transfer is quite remarkable with Getz saxophone and Gilberto's voice becoming very life-like and vivid, the detail of the presentation is quite impressive. We can't find such a dynamic and rich sound in any other version of this album on any format. Working at Sterling Sound studios, George Marino had the possibility to use a unique Ampex ATR-102 Tape Deck playback/recording machine, a great piece of professional equipment for mixing and recording but that was not used in vinyl cutting because Ampex never made a version of this deck with a "Preview Head" that is required for that type of utilization. For this particular ATR-102 machine used at Sterling special changes were made to add the "Preview Head" component (this was executed by Mike Spitz from ATR Services and Barry Wolifson from Sterling) making this the only such machine in the world capable of being used in a vinyl cutting lathe and doing so with the highest quality standards that are known for this machine. What we are getting from this reissue is not only a double LP cut at 45rpm but also the fact that this is the very first time we can appreciate this LP with the original Phil Ramone mix-down channel orientation mastered from his original 1963 Master Tape on a 100% analog mastering chain by George Marino at Sterling Sound. 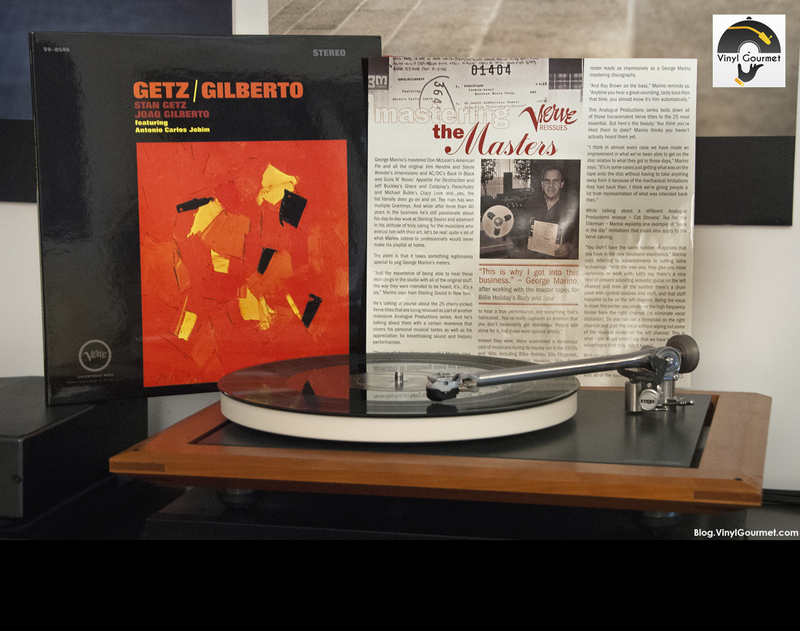 Never before did Getz/Gilberto reach the market with such careful production and fidelity to the source, to the original recording session and Master Tape as it should have been since 1963. Unless we can find a way to get Stan Getz and António Carlos Jobim along with the Gilberto couple to play this timeless classic in our homes right in front of us, nothing will take you closer to that ideal sound than the 1963 Master Tape, and we audiophile music lovers are fortunate to have that now with this Analogue Productions reissue. So, how does this new reissue sound? Well to begin with it's always immensely satisfying to listen to this LP even after so many years of repeated listening there is no tiring of this wonderful music, quite the opposite each and every time I play Getz/Gilberto it sets me on to another voyage of rediscovery and aural pleasure. It never sounded better than on this reissue where the saxophone and voices sound even more real and palpable than before and the balanced, tasteful and faithful equalization options makes it the cleaner sounding version you've ever heard. The lower frequencies, most notably the bass, sound tighter and more focused retaining all the tonal detail unlike some previous audiophile atempts such as the older Mobile Fidelity LP with its exaggerated equalization that makes the album sound a bit unreal and unbalanced. The mid-range frequencies are presented flat and natural, the overall balance of the original Master Tape was expertly transferred on this new remaster resulting in impressive timbre accuracy, life-like transient response and an increased sense of harmony in the fusion of all the instruments and voices. This new George Marino cut is also free from other issues related to the panning of elements in the mix like hearing João Gilberto's voice coming from a different location than his guitar or having Astrud's voice placed closer to the center of the sound stage, on this reissue all the elements are kept coherent with the original recording and Phil Ramone's original stereo mix. 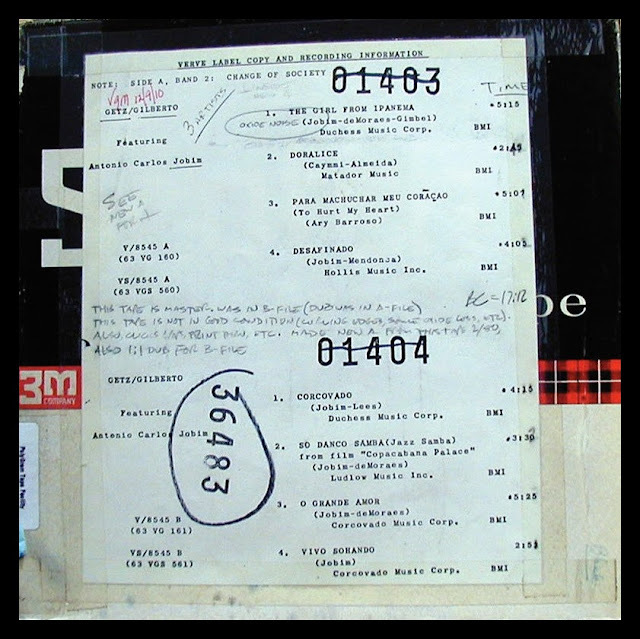 Besides the odd minor distortion snippet that is present on this 1963 Master Tape, another age and manipulation related concern is usually related to the the high frequencies energy and extension. What can be said about this is that the high frequencies on this reissue sound with enough presence and very well preserved as well as possessing extended range and natural sounding timbre. Certainly if this LP had been cut using currently available technology and these high production standards back in 1964 with this same fresh "just recorded" tape there would be more information available in those high frequencies to cut but there is absolutely no reason to feel like the audiophile quality and sound fidelity of this reissue is compromised in any way because the new mastering and pressing are far superior in all possible aspects. I was relieved to find that George Marino resisted the temptation to try and unnecessarily compensate this with exaggerated and intrusive equalization options, such as other Mastering Engineers had done before, that would certainly have a negative impact on all the instruments and voices changing the original tonality of the recording effectively defeating the good taste and extremely careful production efforts they put into this reissue. This Analogue Productions reissue cut by George Marino at Sterling Sound studios is, in my opinion and with little room for doubt, the best release of this album ever made, this is pure classic Bossa Nova Jazz on the ultimate reissue LP, a must have for any vinyl collector and music lover. The pressing for this release was made to double 200gr vinyl LP's cut at 45rpm by QRP (Quality Record Pressings, part of Chad Kassem's Acoustic Sounds) in the U.S.A. and it does meet our high expectations and the relatively high price tag of this reissue. Although some minor and sparse noise "ticks" were detected during playback of my personal copy on my notoriously unforgiving sound system, these were quite irrelevant and both records sit almost completely flat on the platter, it can be said that the pressing is close to perfect on very high quality silent vinyl. The packaging is superb, heavy stock cardboard was used for the glossy finished gatefold cover and the inner sleeves are made of "polyethylene" material to protect the records avoiding scratches and reducing static. This is a limited edition and according to Analogue Productions only the first 2500 units were numbered. Right now this double LP set is still in print and available for the non-numbered version but it will not be around forever! Not to be missed, and an obvious choice to start the Vinyl Gourmet Audiophile TOP 100 list. This article was originally written by myself in Portuguese and published at www.ViciAudio.pt on May 13, 2012. This is the English version of that same article from more than one year ago... In the mean time George Marino has passed away, I would like to dedicate this article to his memory and to his family. 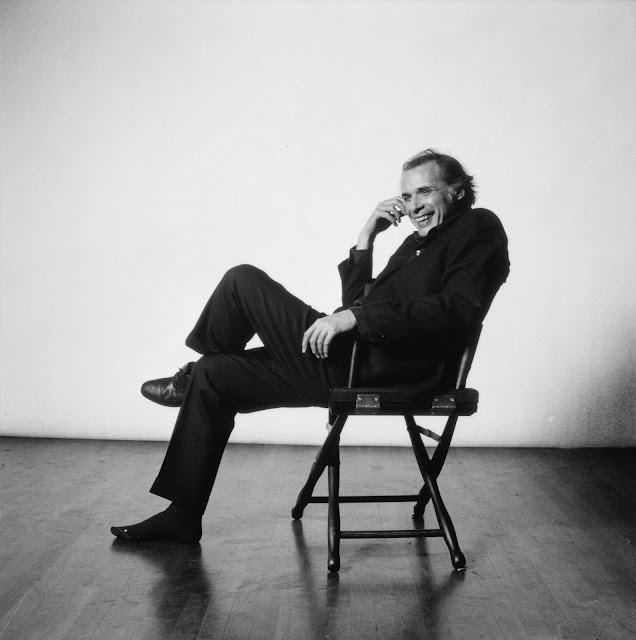 Thank you George Marino for your wonderful legacy! 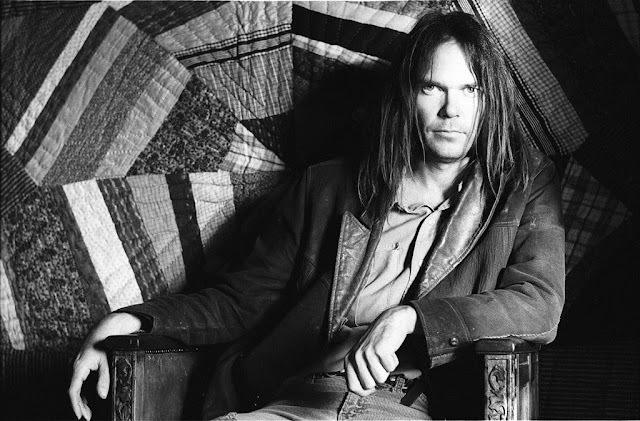 As part of the Neil Young Archives Official Release Series ongoing project, the first four Neil Young studio albums were remastered from the original analog Master Tapes and reissued on vinyl in 2009. These have come to market in several shapes like 140gr vinyl, 180gr vinyl and a boxset with all four albums, for the US and European markets. This article focuses on the fourth album "Harvest" that for me is one of the best music albums ever made, I like it so much that I really had to find what is the all time ultimate mastering and pressing of this masterpiece and I want to share my findings with you. The music is sublime and the album has a strategic harmony to bring the listener running through emotional fields full of sweet melodies like "Out On The Weekend" and "Harvest", sometimes taking you through memories and stories of mild nostalgic despair like "A Man Needs a Maid" and "Old Man" setting the ground for the spine tingling "The Needle and The Damage Done" and shivering your soul up to the mind blowing finale with the power of "Words". 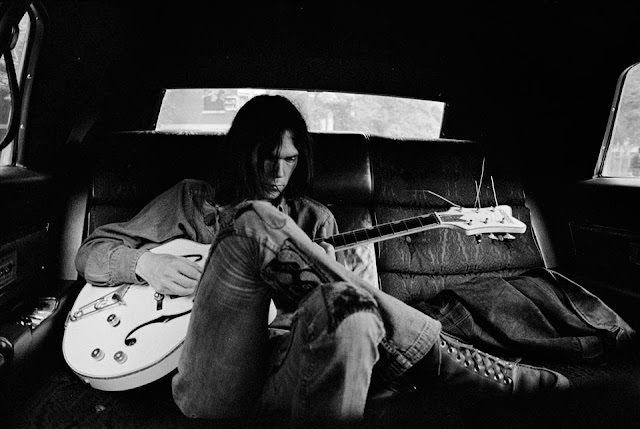 Brilliant music from the pure genius of Neil Young. We are lucky to have Neil's music and even more lucky because Neil Young is a true Audiophile! He's not only a music legend, but this is also a man seriously concerned with the sound quality that can be appreciated when listening to his music, he makes all possible efforts to ensure his fans get to hear these beautiful albums with the highest possible fidelity to the source recording. For this reason, Chris Bellman from Bernie Grundman Studios was given the original Master Tapes to cut these new vinyl reissues that are produced 100% analog and provide amazing sound quality and the highest possible fidelity. When it comes to "Harvest" on LP, the most appreciated version and almost universally preferred LP has always been the famous 1972 original USA release mastered by Lee Hulko at Sterling, the famous engineer whose work is utterly respected by audiophiles and professionals alike. There have been other releases from other countries, some reissues, and even audiophile attempts like the Half Speed Mastered Nautilus Series "Harvest" LP from 1982, but when it came to put the best up on the throne, Lee Hulko's cut was the ultimate choice for most experienced listeners. When this reissue appeared in 2009, being cut from the best source by one of the best Mastering studios in the world today, the first big question was obvious: how does it compare to the original LP? Can it sound even better? I was very much intrigued all these years by so many people mentioning the original Lee Hulko cut, so I had to find one to hear it myself! Well, after a long search for an original LP that was truly in great condition (not an easy task, most of them were played to death back then and surface noise can be a problem) I finally found one and now I was able to make my own comparison review, this article is about the 1972 Original vs 2009 Reissue shootout. A couple of hours into the comparison work, track by track runs and looking for all the little details and nuances, these were my listening notes. - Lower frequencies, specially bass notes, bloom wider and with more intensity, more of a room filler sound that also gives a "slower" feeling to the rhythm of the songs. - Mid band frequencies seem to be a little recessed in the soundstage, and the higher frequencies a little bit rolled off. This can be heard in the way Neil's voice and the drums cymbals present themselves, these can sound a little muted sometimes. - There's a general sweetness to the sound, it is very relaxed and enjoyable. - Lower frequencies, that bass, are now a little tighter and faster. - Drums, and specially cymbals, are brought back into the mix in a more realistic presentation. - Neil's voice has less of that eery quality to it, sounds more upfront and present in the room. - Overall it sounds with more dynamic range and better resolution of details. To sum it up, I'd say that these two masterings are not very different, they are certainly closer than many other shootouts I've done. Tonality, the timbre of all the elements, is just about the same, listening to any of these versions will give you pretty much the same information about the instruments being played or who's singing... the main changes are more related to subtle EQ moves and maybe the overall transparency of the mastering chain. My listening notes are written in such a way that makes it easier to describe the differences I've heard and get the "message" across to the reader, but much more than that is left unsaid (it would take pages and pages to describe everything). The main choice here seems to be between the overall sweetness and relaxed sound of the original, or the increased dynamics and added information of the reissue. Both sound absolutely great, so the choice may just come down to personal preference or better matching to your audio system. My personal choice is the 2009 reissue, I think overall it's the version with the highest fidelity to the source tape and the one that provides the deepest insight about this amazing album without becoming analytic or over detailed. There is an added grunt to the reissue that works very well to make the album more cohesive and easier to understand. This remaster is really a great job! Also, it is extremely difficult to find the original Lee Hulko cut pressing in truly great shape that allows you to enjoy this music with the sound quality it deserves, original copies were played a lot and after more than 35 years in storage or in the used market most have not been very well cared for... even if one does find a minty mint unplayed original LP, the quality of the vinyl material used for this German pressed 2009 reissue is indeed superior with lower noise floor and allows for a more silent playback. 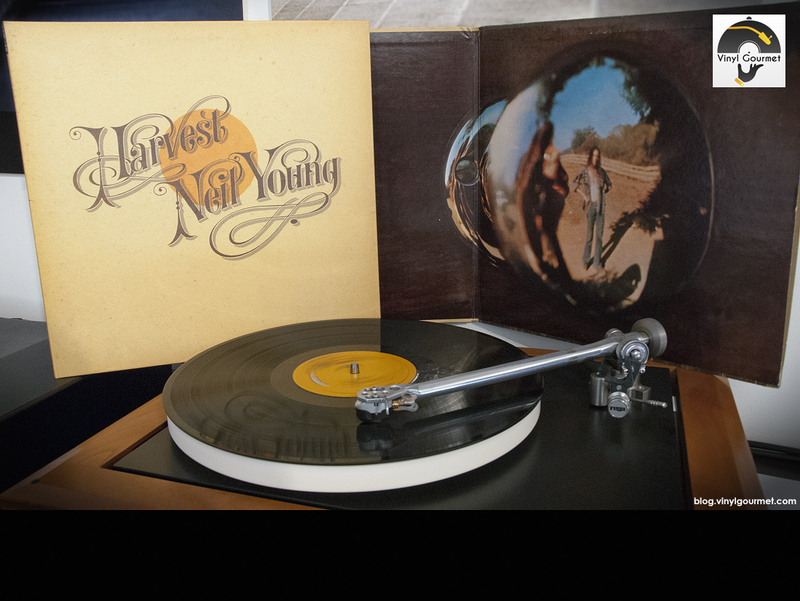 Another interesting aspect of "Harvest" is how superior the vinyl sounds when compared to the existing CD versions. I mean, I really love this album, but it never really clicked for me on CD like it does on LP. This is usually the case but "Harvest" is probably the one album that showcases how some music simply can't fit into bits and bytes, for some reason... If you love this music like I do, please do get it on vinyl! On a perfectionist note, you should know there was a US release (cat number 517937-1) and another European release (cat number 9362-49786-5) of this "Harvest" reissue, and that they do share the exact same mastering being pressed from the same stampers cut by Chris Bellman. 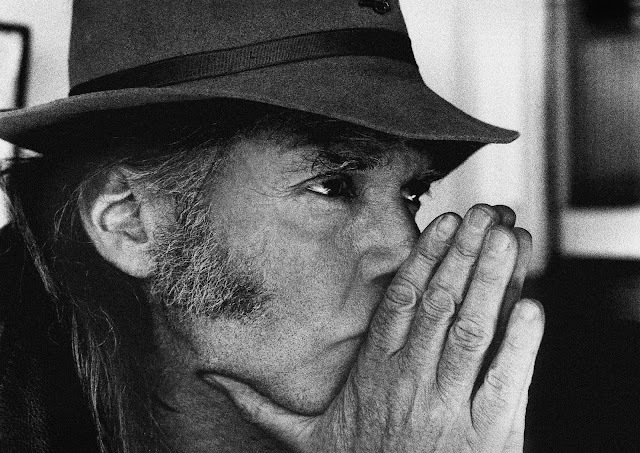 There are dozens of reports about noisy pressings on the US version, on the other hand the latest Pallas (Germany) pressed LP's are dead silent and flat, and I've also found that the artwork and packaging quality is superior on the European versions of these Neil Young Archives Official Release Series LP's with thicker cardboard stock and replicated details are impressively executed. You've read it on Blog.VinylGourmet.com ... also check it out on Facebook.VinylGourmet.com! 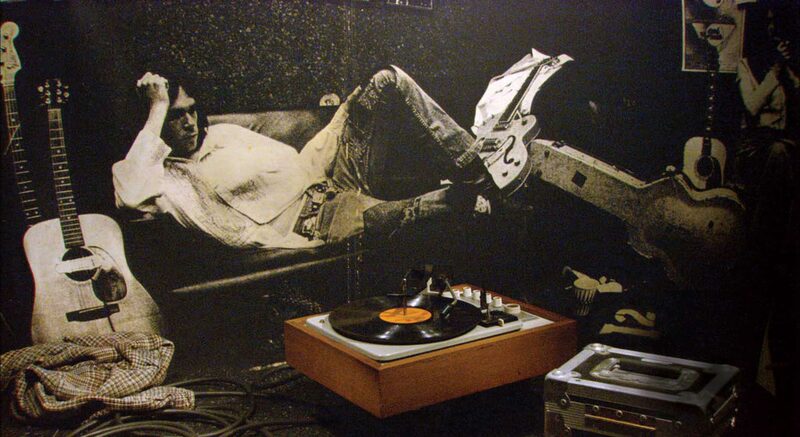 Vinyl Gourmet your source for information about Audiophile LP records. As music lovers, audiophiles and collectors worldwide, we want it all! But it's not easy to own all the new records being released these days... you can at least go for the best ones! Between mainstream and audiophile LP's, there's a lot of good stuff coming out, new music and older music... all it takes is that the music is good and the production of the vinyl LP is the best it can be, and we have a winner. Vinyl Gourmet gives you the inside information and all the details about what's really good and worth your money, time (and shelf room), for the best music from today and from the past being made with the best production standards and from the best sources for our beloved analog LP's. Stay tuned and enjoy the ride... music is our game!